Q: On January 31, French, German and UK Foreign Ministers announced the creation of the Instrument for Supporting Trade Exchanges for Iran in a joint statement. What is your comment? A: The Chinese side highly appreciates these efforts made by the European countries in upholding the JCPOA and supports the creation of the Instrument for Supporting Trade Exchanges (INSTEX). This showcases the European side's determination to safeguard multilateralism. 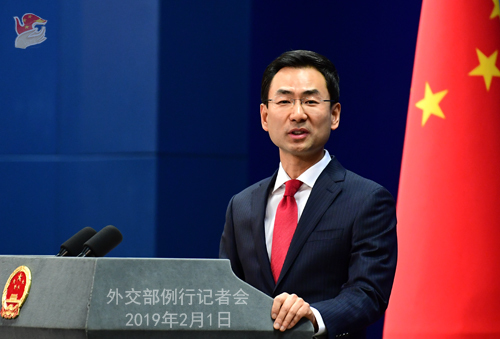 China supports their efforts in sustaining cooperation with Iran, getting INSTEX up and running at an early date, and opening it to third parties to promote normal economic and trade cooperation between the international community and Iran. We also firmly support the EU's leading role in upholding the JCPOA through political and diplomatic means. China maintains that the JCPOA, as an important outcome of multilateralism endorsed by the United Nations Security Council, should be implemented in a comprehensive and effective way. This will serve peace and stability in the Middle East, the international nuclear non-proliferation regime and the common interests of the international community. We hope that all relevant parties could view it from an overall and long-term perspective, stick to the direction of political and diplomatic settlement, and work together to uphold the JCPOA. Q: I have two questions. 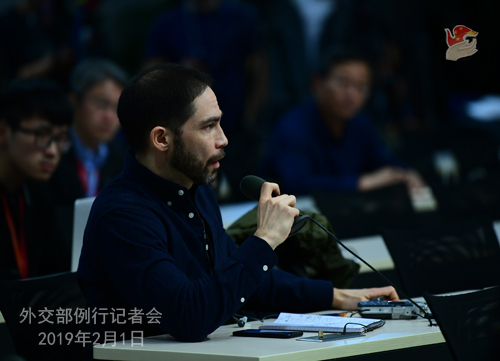 First, is the Chinese government now in contact or has it had any contact in the past with Venezuela's opposition leader Juan Guaido or any of his associates? And the second question is, is China concerned that if Guaido takes power, his government will try to renegotiate or refuse to pay Venezuela's outstanding debt to China? A: Regarding your first question, China has made clear its position on the situation in Venezuela. So instead of repeating it here, I'd like to stress that the Chinese side has been in close communication with all parties in various ways on the situation in Venezuela. We stand ready to work with all parties to promote peace talks and create favorable conditions for the proper settlement of this issue. As for the debt issue you asked about, China-Venezuela relations are normal state-to-state relations. Our practical cooperation has been long-standing and is based on equality, mutual benefit, common development and commercial principles. It complies with laws and regulations and should be above any harm no matter how the situation may evolve. Upholding the principle of equality, mutual benefit, win-win cooperation and common development, China will continue to boost its exchanges and cooperation with Venezuela in various fields. Q: President Trump said that US Trade Representative Lighthizer and Treasury Secretary Mnuchin will come to China in mid-February for talks. Can you tell us if the dates are set? Also, when will President Xi and President Trump meet? Will that be in China? A: To answer your first question, during this round of trade talks, the two sides agreed on the timetable and roadmap for the next-step consultations. As for the specific arrangements you asked about, including the dates, I would refer you to the competent authority. On your second question, we noted that President Trump said that he looks forward to another meeting with President Xi Jinping. As President Xi Jinping said in his message to President Trump, he also hopes to keep in close contact with President Trump in various ways. Q: There are reports that a Hong Kong-listed security firm called Frontier Services Group run by the Blackwater founder has signed a deal with authorities in China to build a training center in Xinjiang. Could you provide more details on this deal? What kind of training will be provided? A: This is hardly a diplomatic question. I would refer you to the competent authority if you want to know more about it. Q: You just said that China is maintaining close contact with all parties. Are we to understand from that you have been in touch with the opposition leader in Venezuela? A: As I just said, China maintains close communication with all parties through various means on the Venezuelan situation. Q: It is reported that US lawmakers on both sides of the political aisle have nominated Ilham Tohti for the Nobel peace prize. What is your comment? A: Ilham Tohti is convicted of dismembering the nation. What he did was meant to split the country, stoke hatred and justify violence and terrorism, which cannot be condoned in any country. The international community should have a clear understanding of this. Q: Uruguay and Mexico announced earlier this week that they are going to organize a conference on the Venezuelan issue on February 7th in Montevideo. They also said that the conference will involve more than ten countries and international organizations. I wonder if China is going to attend the conference? If yes, who is going to represent China there? A: We have noted relevant developments. China has for many times called on relevant parties to engage in peaceful dialogues to find a political solution to the Venezuelan issue as soon as possible. I would like to reiterate China's readiness to work with all parties towards this end. Q: One more question on Venezuela. The opposition leader, self-proclaimed "interim president", said that changing recognition to his government away from Maduro would benefit Venezuela's creditors, including China. Do you have a comment on his remarks? A: When answering an earlier question, I said that China-Venezuela cooperation is based on equality, mutual benefit, common development and commercial principles and abides by laws and regulations. No matter how the situation evolves, China-Venezuela cooperation should not be undermined. Q: How is the current China-Japan Security Dialogue going on? What outcomes does China expect from it? A: Yesterday I answered a question on the China-Japan Security Dialogue. As far I as I know, during this dialogue and the regular consultation between the diplomatic authorities of the two sides, China and Japan will have an extensive and in-depth exchange of views on bilateral relations, policies on national defense and security, and global and regional issues of mutual interest. The dialogue is still underway. I'm sure you will get more specifics after it concludes. Q: A question on China-US trade talks. Some say the Chinese and US Presidents will meet in February in Hainan Province, China. Is it true? A: I just answered a similar question. We have noted that President Trump says he looks forward to meeting President Xi Jinping again. Similarly, President Xi also expressed in the message to President Trump his readiness to keep close contact with him in various ways. 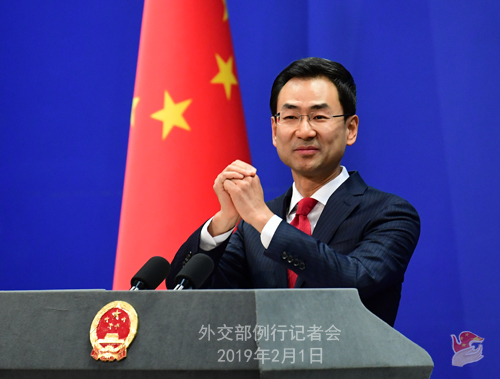 According to the holiday schedule for the 2019 Spring Festival, the regular press conference of the Foreign Ministry will be adjourned starting from Monday, February 4 and resumed on Monday, February 11. During the holiday, you can pose your questions to the Spokesperson's Office via fax or email. Today is our last press conference in the Chinese Lunar Year of the Dog. On behalf of my colleagues, Lu Kang and Hua Chunying, I would like to express our heartfelt appreciation for your support and cooperation over the past year! We look forward to continuing such close cooperation with you in the new year. Here, I would like to take this opportunity to extend new year greetings to all of you and through you, to all the friends who have been following China's diplomacy. Wish you all an auspicious Year of the Pig with health, success and happiness! Happy Chinese New Year!